Montrose Fasteners, based in High Wycombe, Buckinghamshire, is one of Europe’s premier suppliers of industrial stainless steel fixings, fasteners, tools, personal protective equipment (PPE) and consumables. 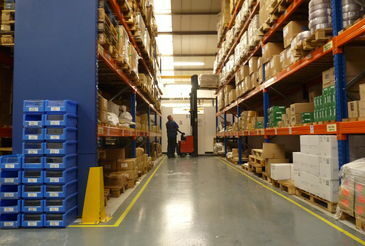 They have one of the most comprehensive stainless steel fastener stock profiles in the UK. Montrose has been using prof.ITplus since 2005, has 51 employees, 1,100 customers, 58,000 stock lines and takes an average of 600 orders per week generating an annual turnover in excess of £7,000,000. Montrose Fasteners Ltd, based in Buckinghamshire, has 11 years of prof.ITplus usage under its belt and in that time has integrated the system across all functions of the organisation to great effect. Montrose is a key player in the fasteners and fixings industry and specialises in a ‘Vendor Managed Inventory’ (VMI) system of supply and delivery to their customers. VMI is based on lean business management systems, known as ‘just-in-time’ and ‘Kanban’. In essence, Montrose will take responsibility, on behalf of their customers, for a wide range of relatively low cost fastener and fixing components and deliver them into their customers’ manufacturing processes at exactly the right time and to the exact required quantity. This offers Montrose’s customers a dramatic reduction on the ‘delivered cost’ of any component because they have no need to store components, it reduces the time spent on procurement, it lessens the burden of administration and frees up more space for production (rather than storage). The quality of the service offered to their customers is clear to see and so too is the need for a sophisticated yet robust ERP system (enterprise resource planning) to efficiently and comprehensively manage these exemplary service levels offered to their customers. Based on customer feedback and the close relationships we have with our customers, we are very confident of our claims that prof.ITplus can deliver greater organisational efficiency, better customer service levels, increased productivity and boosted turnover. prof.ITplus is currently in use across the UK by around 400 organisations amounting to around 7,000 individual users. The software is written by our in-house UK-based team of developers specifically for stockists, distributors and wholesalers. “We realised that we had to invest heavily in an ERP system to match our ambitions at Montrose, to be ahead of the competition and offer service levels that others can’t. Over the years prof.ITplus has become more and more important. Choosing the right system back in 2005 was so important; if we’d got it wrong the repercussions would have been felt across the entire organisation. We definitely came to the right decision by selecting prof.ITplus.